Tonight is another American Idol Results show – last night our ‘Top 5’ performed a song from the 1960s, a British pop song, and one group number. The performances were overall pretty good last night but someone has to go home. After tonight we will be down to our ‘Top 4.’ If you missed last night’s show we have a full and detailed recap here. If you missed any on last night’s performances we have all the videos here. We conducted a poll today to find out who our viewers thought would be going home tonight. 34.1 % think Philip Philips will be on his way out followed by Jessica Sanchez with 20.81% of the vote and following closely Holly Cavanaugh at 19.65% of the votes. The results are surprising so I think we will have another elimination shocker tonight. If you have not entered our poll yet there is still time, go here! Also performaing tonight is one of American Idols most successful winners Carrie Underwood who will be on hand to perform a single from her new album Blown Away. We will be live blogging ‘The Results Show’ with all the up-to-the-minute details at 8 PM EST so make sure to come back to this spot and watch the show with us. Refresh often to get the latest updates! RECAP: Tonight we find out who is going to be the final four, will Jessica Sanchez be punished for her Tina Turner impression? Will Hollie Cavanagh’s improvement make the difference in her staying another week? Up first tonight is Joshua Ledet. Jimmy compares Joshua’s degree of difficulty to Randy Jackson winning the Kentucky Derby as a jockey, lol. Joshua tells Ryan that he wants to make music with a message. After the nationwide vote, Joshua is safe. Hollie and Phillip are up next. Jimmy thought this was a critical week for Hollie and thought she nailed “River Deep, Mountain High.” But. he questions her lack of magic. Jimmy felt that Phillip had two boring and bland performances last night and that he should be in the Bottom Two. Sadly, Hollie is in the bottom two, not that I wanted Phillip to be there, but she did a good job last night. Phillip is safe. Skylar and Jessica are the last two to be called up on stage. Jimmy loves how polite Skylar is, he finds she is a fighter and really wants to win. The only criticism, he thinks that she could have read the lyricks better and the set up was a little strange, although she doesn’t deserve to go home. When it comes to Jessica, Jimmy thinks last night was a travesty, her dress was too mature and he is sure that people were uncomfortable, he even called her performance, “burlesque”. Jessica is safe, OMG, the voters are so dumb. 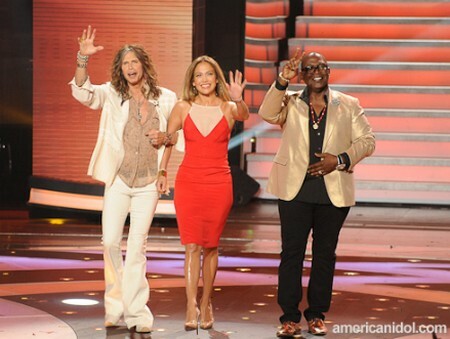 Skylar is in the bottom two and although I am not a fan, Jessica deserves to be there. No surprise if you ask me, her performances were just as dorky as her clothes and half the time I couldn’t even understand what she was singing. What do you think, did she deserve to go home? Who do you want to win? Sound off your comments below.